How Did We Get Into This Mess? : Happy Ed Roberts Day! Google made a Doodle of Ed Roberts, the legendary disability rights activist! Description: A drawing of Ed Roberts, a man in a wheelchair with red shirt and grey pants, speaking into a microphone, oxygen tube in the corner of his mouth (as was true in so many pictures of him!). He's in a classroom setting, a white board behind him, people listening (represented abstractly as heads of different colors) and GOOGLE on the wall. The second O in GOOGLE is a clock showing 2:00. 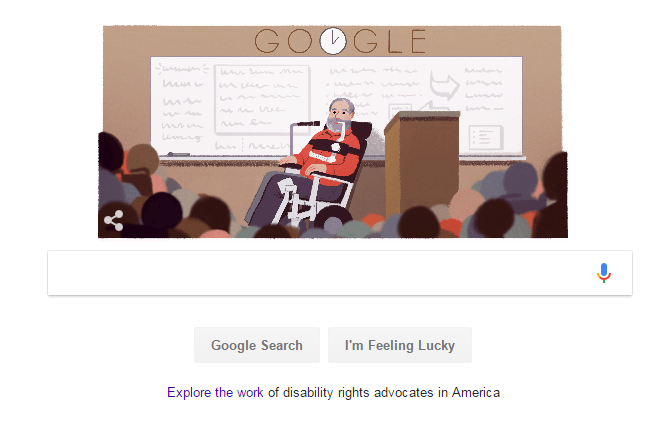 If you click on the link - Explore the work of disability rights advocates in America - You get to a virtual exhibit funded by Google.org, organized by AAPD, curated by the amazing Allie Cannington and Amber Melvin, and written by me. It was part of the ADA25 celebrations. Some things I'm proud of in the exhibit. It starts by defining Ableism. The history of the disability rights movement is a history of oppression and resistance. It's not some feel-good pablum about overcoming stuff. It ends with: The disability rights movement has always depended on people with and without disabilities, youth movements, mentors, cross-disability and cross-movement alliances, and lots of hard work. There are so many ways to fight ableism and promote the freedoms and ensure justice for all people with disabilities. It's an exhibit that tried, in highly constrained spaces, be at once joyous about the victories and real about the struggles. I also, with Blaise Zerega, interviewed Nora Roberts (Ed's mom) and co-wrote a biography for the ADA25. A station wagon rolled up to Burlingame High School in Burlingame, California at lunchtime. A young man was unloaded from the car by his family, who carefully supported his head, his back, and his legs while doing so. For the past few years he had been so terrified of being stared at that he had not wanted to leave the house. Arriving in the lunch courtyard, where hundreds of students were gathered, he looked up, and his worst fear was realized. Everyone turned to gawk at him. “When I looked up at them, they looked away,” he recalled. The man was Ed Roberts, who was then in his senior year of high school. As a young boy, he had loved football and baseball, and was the fastest kid on the block. But at age 14, in 1953, polio paralyzed him from the neck down. From then on, he used an iron lung to breathe and a wheelchair to move around. His doctor said he’d be a vegetable. A few years later, he started college at U.C. Berkeley and quickly convinced the university to let him take up residence in an old hospital wing. Soon, other disabled students arrived to build on Roberts’ improvised accommodations. They initially called themselves the Rolling Quads—named for quadriplegics in wheelchairs— which he later organized into the Physically Disabled Students Program. The PDSP eventually became the Center for Independent Living, which extended its benefits beyond the confines of the campus and helped make Berkeley into one of the most accessible cities in the world. Later, Roberts became Director of Rehabilitation Service in California, co-founded the World Institute on Disability with Judy Heumann, served as an inspirational leader in the fight for the ADA, and travelled the world to learn and teach wherever he went. He passed away in 1995, having seen the ADA realized five years earlier. Alice Wong, of the awesome Disability Visibility Project, made this. STAY PRICKLY. You can read the image description and sourcing for Alice's image here. #1) Find your local groups that do advocacy work led by people with disabilities who are from the communities with which they work. I followed with a shout out to the Protection and Advocacy Network, listed a bunch of orgs that I personally like or have worked with (emphasizing this is just my experience), and suggested that this be our guide: "I really want to emphasize though: Look for your local orgs run by people with disabilities from marginalized communities. Fund them."